Search for all "EIF6 / ITGB4BP"
Rabbit anti Human, Mouse, Rat EIF6 / ITGB4BP. 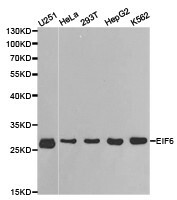 Recombinant protein of human EIF6. 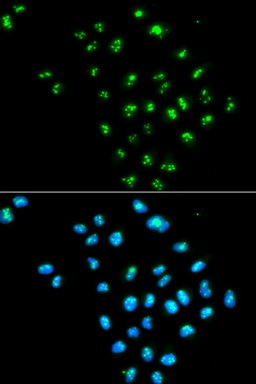 Eukaryotic initiation factor 6 (eIF6) is reqiured for the 60S ribosomal subunit assembly in the nucleolus. In the cytoplasm, this protein is bound to 60S ribosome subunits and prevents them from joining 40S ribosome subunits to form 80S ribosomes. 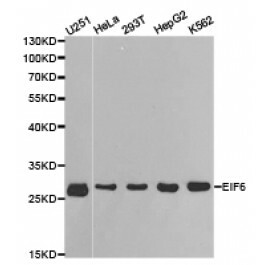 eIF6 is also shown to associate with the R-induced silencing complex (RISC). Deletion of eIF6 abolishes the miR-mediated gene silencing. eIF6 may play its essential role in miR-mediated silencing by inhibiting translation initiation or ribosome recycling.